Not even Seal, is safe from the wrath of Shark Week. The Multi-platinum, Grammy® Award-winning singer-songwriter teamed up with Discovery to promote this year's Shark Week in this creative and hilarious video. 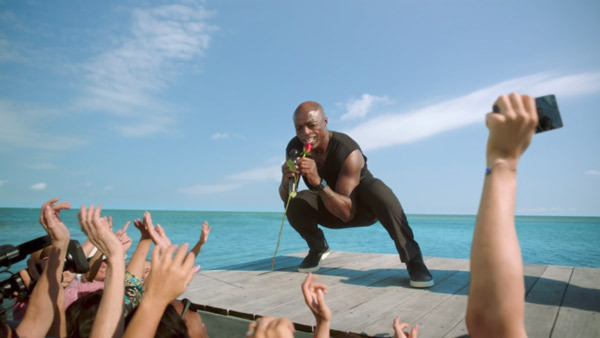 Seal performs his iconic song "Kiss From A Rose" and as he reaches for a rose, a shark appears and eats the singer whole. SHARK WEEK, television's longest-running and most anticipated summer event, airs July 23 at 7:00 P.M. ET/PT and continues through July 30. This year, SHARK WEEK celebrates its 29th anniversary and will keep viewers on the edge of their seat with all-new jaw-dropping shark stories; highlighting some of the most recent breakthroughs and developments to reveal new insights into these magnificent creatures.